I have long adored Marie Antoinette. I was reading her biography when I found out she actually practiced ballet! Having danced myself since the age of four I was delighted to find yet another similarity between myself and the Queen of France. I went to learn more about her foray into the world of dance and in my research learned her life had been interpreted in its own ballet…and was playing in Vienna in May & June! This was the sole deciding factor for me as to why now was the perfect time to finally visit Austria. I am so glad I did, I have fallen head over heals for the country and should I ever make the time to learn German, I will make Austria my home. I decided, since I was seeing the ballet on this day, I would dedicate the entire day to the Austrian Archduchess and visit her summer home before the ballet! Though I’ve been to Paris twice, I have yet to make it to Versailles, much to my dismay. 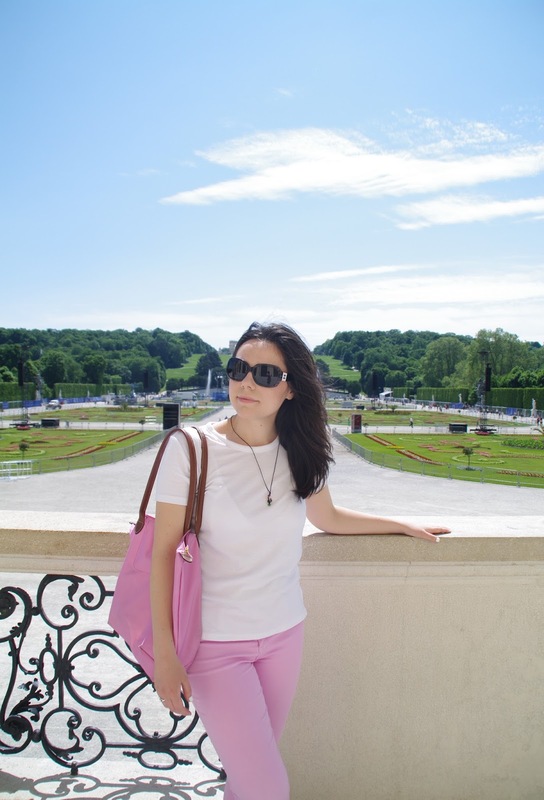 I did make sure though, to make it out to Schönbrunn Palace, just outside the city of Vienna. This beautiful yellow palace, lined with rose bushes was the summer home to such royalty as Marie Antoinette as a little girl and later Empress Elisabeth of Austria, Sissi by nickname. Mozart himself played music on the piano for the Emperor and Empress. Photography is not permitted in the palace, so unfortunately I have no physical evidence of its beauty, but I assure you it is worth the journey outside of the city centre. I took the Grand Tour, which takes one through the ballroom, Sissi’s room and a model depicting her ankle-length chestnut brown hair (hair goals!). Needless to say, the palace is stunning, I can’t believe this is where they summered! The back gardens of Schönbrunn are filled with hedged mazes and labyrinths. I can just imagine a young Marie Antoinette chasing a friend through the maze on a sunny, summer day, the train of her pastel dress trailing behind her. On the same grounds is the Imperial Carriage museum, this is an absolute must if you’re in Vienna! It is filled with Victorian carriages, including the most striking of hearses, topped with black crows. Dying during the reign of the Habsburgs must have been a romantic affair. By far the most astonishing of carriages lies at the back of the museum, led by eleven white horses. The gilded carriage, lined with red velvet and containing beautiful paintings on the side, this may be the most opulent mode of transportation there ever were. Following a day at Schönbrunn we attended the Marie Antoinette ballet at the Volksoper. The beautiful theatre (smaller than the Staatsoper, Vienna’s main opera house) is gorgeous. The seats are tall and plush with red velvet. The theatre is small enough to provide a great view in every seat. At intermission one can step out onto the balcony with a view of the city to enjoy a breath of fresh air between acts. The ballet itself was magical and included much modern dance, the story brought me to tears at points. The next time I’m in Vienna, I hope to attend The Magic Flute (my favourite Opera, by Austria’s favourite composer) at the Staatsoper.